Now that the holidays are behind us and 2014 is here, we’re gearing up for that drop-dead gorgeous swimsuit body for spring/summer season. If you’re thinking of hitting the gym harder than ever before, you’ll want your fitness apparel to look hot, expensive and perform well as you sweat it all out. When you add up the costs, the the amount of cash spent on apparel and accessories can be outrageous. So yeah, we get it – it can be hard to find inexpensive but high-performance fitness gear, so we’ve narrowed down the list of products that are trending. Don’t be afraid to work hard, sweat a lot, get hot and dress the part. I say, Train dirty and look hot doing it. Nike has stepped up its game in its offering of fashionable athletic apparel with this beautifully bold, slim-fitting design. 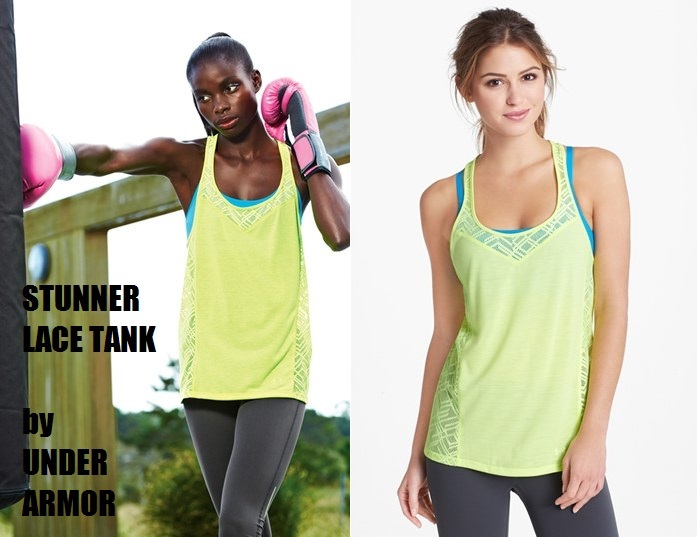 It wicks moisture and has underarm gussets so you can move comfortably while you work hard to break a sweat. Offers 4 way stretch, chic ruching detail, crossback straps and wicks moisture as you sweat during your workout. Basic front and lace racerback for a feminine touch. Has removable padding and handles moisture from your workout. Offers sleek and narrow mesh back. Perfect for low-impact sports. Helps keep your hair in place while you break a sweat during your workout. This lightweight running shoe offers a discrete GEL® Cushioning System that will soften the impact during your run. GEL-Craze™ TR by Asics $85.00 Flexible footwear with GEL® Cushioning System for cross training. This jacket performs as good as it looks. Featuring four-way stretch and moisture-wicking lycra, this great little ruffle detail lets you work hard, play hard while looking simply chic. Look for a chic bag that has smart compartments. We love the Carry Me Om Tote. It has a kangaroo pocket so you can carry a yoga mat on the outside. Exterior pockets make it easy to find your phone and keys. The wet/dry pocket allows you to store your sweat-drenched apparel separately after a hard workout. We love the organic shape of this loose-fitting, feminine quilted jacket. This chic hooded jacket has ribbed cuffs, zip fastening through the front with draw cord and raglan sleeves. Under Armour Storm Duffle Bag has a ventilated laundry poket and offers highly water-resistant finish. It comes as no surprise that as the population becomes more technologically savvy, that our workout gear would as well. If you have not seen a downloaded, seen or heard of a workout app, you certainly will now that you’re planning to hit the gym! Wearable technology is all the hype right now. Whether you are turning to your smart phone for the day’s fitness program or tapping your wrist to kick-start the beginning of your workout, gym routines have become more technologically integrated than ever before. Among some of the most adapted are listed below. Don’t let this simple-looking wristband fool you. The FitBit Force is the latest in the FitBit family. The wireless wristband keeps track of the numbe ros teps you’ve taken, stairs climed, number of minutes you’ve worked out in the day and even tracks your sleep. Available in a variety of colours and compatible with iPhone and select android phones, the LED screen displays the stats to keep you motivated. Like FitBit Force, this chic limited edition wireless wristband helps you keep track of your workout and sleep. Unlike FitBit Force, this wristband only syncs with iPhones and is not quite as flexible on the arm. One of the few benefits is that it is sleeker, more fashionable. In addition to that, FitBit Force really takes into account running, stair climbing and walking, while Nike + Fuelband takes into account calories burned with other workout activities.